Has the UK's debt doubled? The amount the government owes has certainly risen since David Cameron became Prime Minister, but not by quite that much. The key measure (public sector net debt) rose from £960 billion in April 2010, just before the coalition government was elected, to £1.5 trillion five years later. This means the debt has increased by just over 50%, not doubled. It's a similar picture when measuring the debt as a proportion of gross domestic product (GDP). This value changed from 62% in April 2010 to 81% in April 2015—an increase of about a third. The size of the increase fluctuates a lot depending on what years you measure between. If you've read the Daily Mirror's factcheck on the subject, you might be confused by the difference between its facts and ours. The Mirror says that the debt, in cash terms, is up only 27%, where we say 55% (and Mr Farage says 100%). The reason is because 27% is measuring over three years, from 2010-11 to 2013-14, whereas we're counting from April 2010 to February 2015. If you dial the starting point back a year or two, a claim of a 100% increase is valid: the debt has almost doubled since 2008-09. That's measuring over six years, though, not five—and goes back to when Labour were in power. 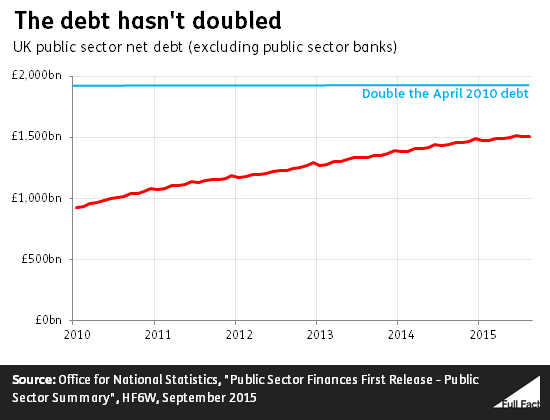 We've updated the graph and some of the text to include the latest figures on debt and debt as a proportion of GDP.